Desde el Monte... Preface is here. I've been sitting here for awhile now with the cursor patiently blinking at me. I've even had to wake up the screen once because it figured I had dozed off or walked away. I was so excited about telling you all about my mission trip to Uruguay in 1998 that I forgot that how I ended up on that trip started with some very painful events. Having to remember it all now is not pleasant, but I wanted you to know why I went. Nobody extended a personal invitation to me to go on that trip. I was not studying missions in school. So why did I end up in Montivideo, Uruguay at the end of that spring? I dropped out of college in 1991 and did not go back again until 1995. I transferred from the local junior college in Corpus Christi, TX to Southwest Texas State University (now just Texas State) in 1996 to pursue a Bachelor's degree in Social Work. When I transferred to Lubbock Christian University in 1997, I was a senior and just a few days past my 28th birthday. There were some complicated reasons involved in going to Lubbock. The Social Work program at Southwest was considered the best bachelors-level program in the state at that time. But it was filled with atheists - on the staff and among the students. I didn't just need to know how to be a social worker. I needed to know how to be a Christian social worker. There were schools in San Antonio and Abilene that I could have gone to, but based on church preference, a boyfriend, and some complicated family issues, I ended up in Lubbock. 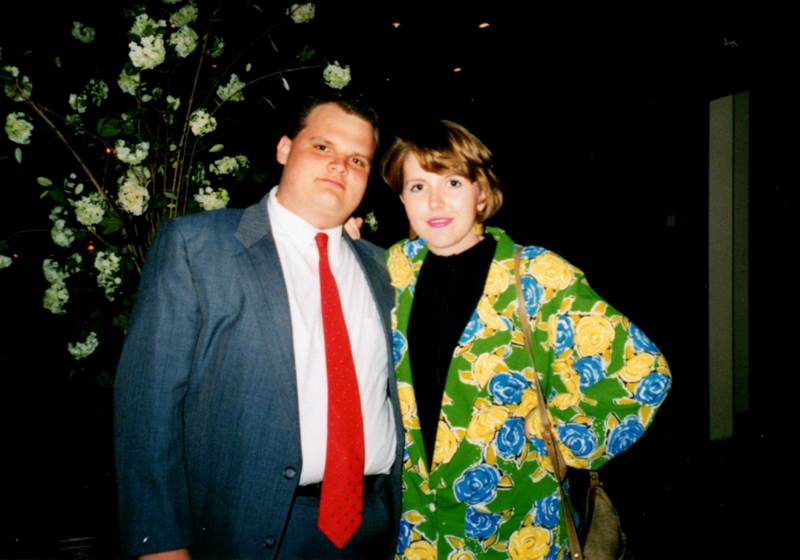 At the end of 1997, the boyfriend and I had a nasty, painful break-up. Coming back from Christmas break to start the Spring semester was so hard. I was not going to be able to avoid seeing him sometimes and the memories that there would be no forthcoming wedding were everywhere. I do not remember exactly what prompted me to get in my little truck and drive nine hours away from home to start another semester. I was so good at running away from painful things that running towards a painful thing was out of character. I wish I could remember what compelled me to go, but I don't. All I know is that in January of 1998 I was back in Lubbock and trying to finish my degree. I do know that I made a conscious decision to get involved in activities that would keep my mind occupied while not in class. I was involved in a tiny prayer ministry (there were 3 of us). I started going to Senior Class meetings (there were 4 that showed up regularly). I went to basketball and baseball games (I'm a football fan). I went to the optional chapel service on Fridays just for the fellowship (most were going to make up an absence at regular chapel services). I worked three student jobs to take up my time. It was working for me, mostly. My gaping wound of heartache had some bandages slapped on it, at least. Yes, that is me at 28 years old with pigtails in my hair. No real idea why. Sitting down are Josh (a Senior Class officer) and Tara (a fellow Social Work student and prayer partner). Standing next to me is an extremely nice guy whose name I cannot remember (Correction: Amy has reminded me that this is Shaun Markwardt. Now if we could just remember his girlfriend's name. She was taking the picture.) 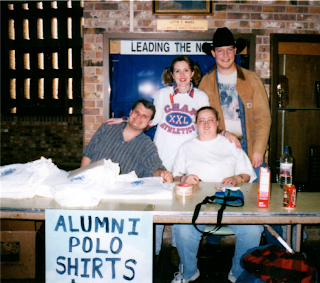 Selling the Alumni polo shirts was our class fundraiser so we could buy the school a gift from our class. I sold the most shirts! Why am I telling you all of this? Because I want you to know that I did not end up on a mission trip because I was noble and altruistic. I was not burning from the inside out with The Great Commission (Matthew 28:16-20). I was trying to stay very involved in school activities so I could avoid thinking about how I was not getting involved in wedding activities (do NOT underestimate how important that is for a girl raised in the Church of Christ). So when it was announced in chapel one day that there would be a meeting in the Bible building for anyone interested in going on a mission trip that summer, I was in. Most of the students in our Missions program were interested in Africa, so I was surprised that there was a trip going to South America, but who cared? It was a mission trip, which was a very popular thing to do at least once while at LCU. As it turns out, LCU was not one of the sponsors of the trip. The informational meeting in the Bible building was a courtesy to one of the local churches. That congregation, South Plains, sponsored one of the missionaries in Montivideo, Uruguay. They were partnering with a congregation in Abilene, and also with Abilene Christian University, to send two groups (one in May and one at the end of June) to Uruguay that year. So I was off to another informational meeting at the church. Most people consider me friendly and approachable (a good thing), but I can be very timid in certain situations. I am one of the women who will have to admit to hiding in bathrooms because the social situation at hand was intimidating. The informational meeting over at South Plains should have been enough to turn me away. First of all, I don't speak Spanish (a sad thing for a girl raised in south Texas). I had never done any type of mission work at all. We found out that Uruguay was actually a mainly atheist country (who would have guessed?). We would not be working with church members so much as we would be out on the street trying to convince total strangers to come to a gospel meeting (try doing that in a foreign language that you don't know!). We were also told that we should not expect to see any conversions AT ALL while we were down there. We would just be planting seeds. It seems that spiritual seeds take a very long time to germinate in Uruguay. There was one woman in the tiny congregation down there who had been collecting fliers and brochures about that church for fifteen years before she ever considered attending the church. Evidently, that was a very typical experience in the Uruguayan mission field. So if we wanted instant gratification of any kind (I happen to really enjoy instant gratification), this might not be the trip to go on. I decided to go anyway. It must have been the Spirit pushing me, because I don't remember having a compelling reason of my own. So then there was the flurry of fundraising activities. I sent out letters to everyone I had ever known and everyone my parents had ever known. For some reason, people actually started sending checks. A wonderful woman at my parents' church, Mary Zuniga, held a bake sale in front of the tiny grocery store in her town so she could make sure that I had spending money while on the trip. (I love you, Mary. Your heart is so big and I want to be like you when I grow up.) I actually saved a few dollars of my own. Things started falling into place so that I could go. The end of the semester was full of activity. I got a passport. I got new luggage. I was preparing for final exams, too, so I had just enough energy to be enthusiastic about the mission trip, but not enough time to think it to death and get too scared to go. I was preparing for graduation (I was actually an August graduate, but we got invited to participate in the May ceremonies). I was so blessed by the excitement of my friends and family. Denise (Gray) Galbraith became one of my personal cheerleaders as did Amy (Dodd) Peterson. They kept me praying and playing during those months. I even managed to go to a wedding on the day I had hoped to get married on without having a nervous breakdown. Life was good. I was going to graduate with honors AND be a missionary! I had arrived. hair/clothes/make-up added just to make Amy (Dodd) Peterson laugh. Notice all of the me, me, me? Yes, it was all about me. Until three days after the graduation ceremonies when I got on that plane and started thinking about all of the people we were supposed to meet and greet in the name of our Savior. I was too scared to ask the pilot to turn the plane around and head back north of the equator, and I realized that I was "committed to the hit" (football phrase). So I started praying hard. Me and all my selfish motivations were about to have a spiritual experience. Tune in again next Sunday for another installment of Desde el Monte... (from the mountain). LOVED reading this. You, my dear friend, are a writer and you have some story to tell. I look forward to the next installment! @Amy Thank you, my love. I'm glad to write it. I've lost too many of these memories as it is. God is so good. He can use us, even in spite of our lesser intentions. Isn't that amazing? I'm so glad you went, so glad you're sharing your story here. @Jennifer @ GettingDownWithJesus.com Jennifer, God would not be able to use me if He could not use my lesser intentions. I seem to be full of them. He redeems me constantly, and I am in awe of it. I am grateful that I got to go to Uruguay. I would love to go back, even though I still don't know Spanish!